Babygram began as an idea to build word-of-mouth awareness and create a community by giving Nova's customers a ready-to-go gift they could send to a friend or family member at no cost to themselves; have a young child or new infant you know about in someone's life? Send them a cute surprise in a branded package ready for delivery. To accomplish this, at its very base, Babygram would need a branded Tyvek envelope and an insert explaining both the organic doll and how the recipient could pay the gift forwards, or join a new community. The goal of the design was, then, to create an envelope that would be eye-catching and friendly upon receipt, as its arrival was planned as a surprise, and an insert that would be informational and welcoming. To accomplish this, we went with recycled Tyvek envelopes to compliment the organic nature of the dolls, and created a repeating pattern of the Nova Natural star and the dolls which they could receive. A postcard-sized insert would carry a more subdued version of the same design direction, pulling the branding through from the initial package to its contents, and used large or brightly colored text to explain what they were receiving. On its back was a illustration of an Instagram post to reflect the down-to-earth nature of Nova while still inviting them to join a community in a way that was friendly, casual, and open. It was important that this playful, open branding was carried through the whole Babygram experience, even as it moved to web and email. As the process of ordering a Babygram for a friend would have several touch points, it was important the process never felt tedious or cold. 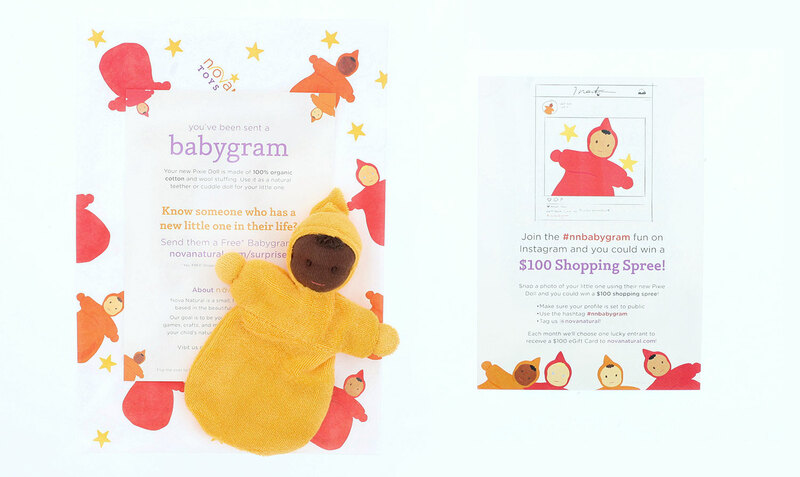 A "Sign Up for a Babygram Code" allowed customers to sign up to receive via email the code they would use to send a Babygram for free, and used the similar illustrations of the dolls to show what they would be sending. 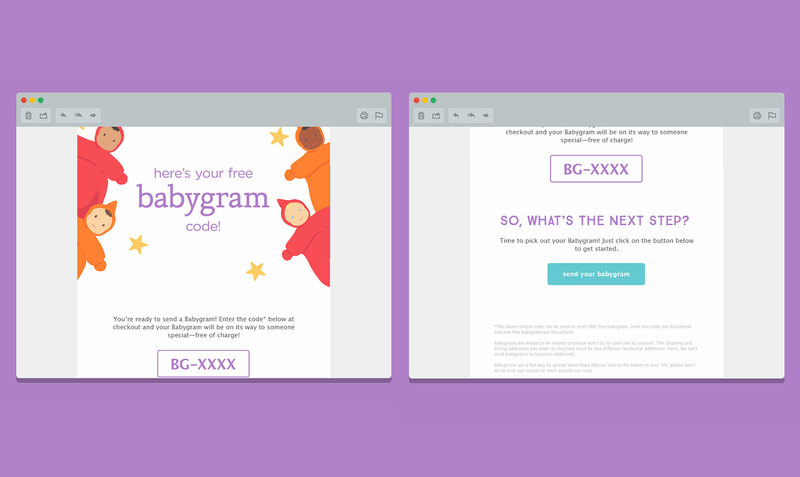 An initial email with the code used bold text "Here's Your Free Babygram Code" to announce and celebrate the first steps in the process, and had a clear call to action to direct them to placing the order. 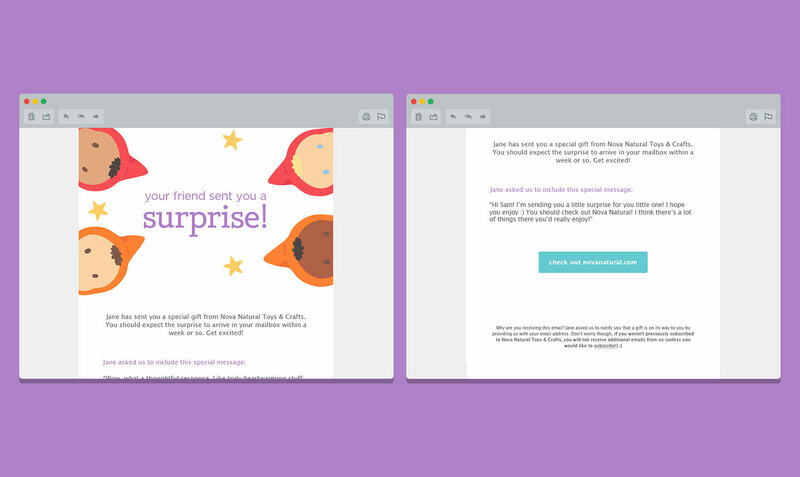 If the email went unopened, a reminder email was later sent using similarly bold, playful branding to remind them of the gift they could send. 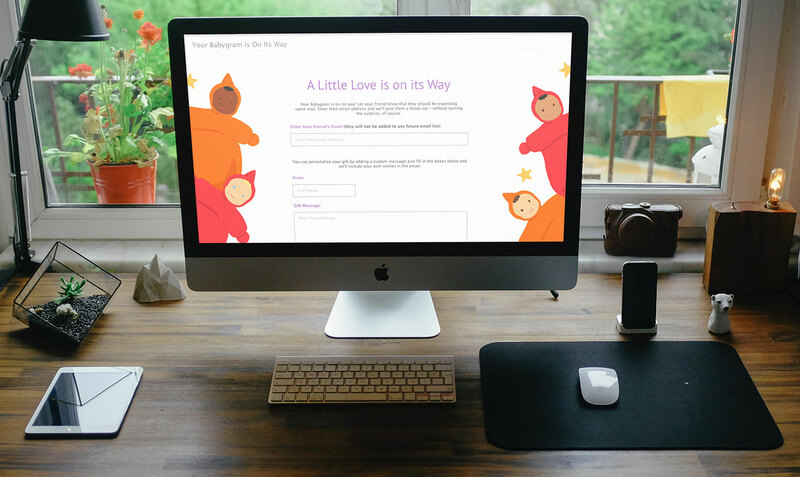 Once an order was placed, another email was sent, "Let Them Know", directing customers to a branded form to write a little message that would be emailed to their friend ahead of the doll's arrival, giving them some indication a gift was coming. This email in turn had the dolls peaking in from the sides, a little tease of what was coming in a way that invoked peekaboo, and clearly included the message from their friend so that they weren't confused by a strange company emailing them out of the blue! A quiet invitation to subscribe to the newsletter invites them to join the Nova Community without being the focus of the email. Then emails to the original sender recommending other products inline with baby toys and products they may also find helpful in their lives. Overall, it was important that each of these touch points was familiar and never once strayed from the branding of the project as a whole, creating an experience that felt unified, fun, and as playful as the dolls they were sending from start to finish, and from web to print.